I have created a list of the best cat treat dispenser toys that will be boredom busters for your cat and maybe help them get some exercise. A cat treat dispenser toy is a cat toy that when they move it around while playing will dispense cat treats. This self-play toy is great for cats that are left at home alone as they can play and get a treat all by themselves. When you let your cat play with the treat dispenser toy, make sure to be aware of the calories in the treats that are dispensed if you need to watch your cat’s caloric intake. You can also find lower calorie treats for your cat. If your cat eats too many treats often, it can cause them to become overweight or obese. Cat treat dispensers are meant as a treat or to entertain your cat, not for a full feeding. You can monitor how many treats your cat gets so they don’t overindulge. With the holidays almost here, I thought to create a list of interactive cat treat dispenser toys, in case Santa decides to bring one for your little four-legged family member! 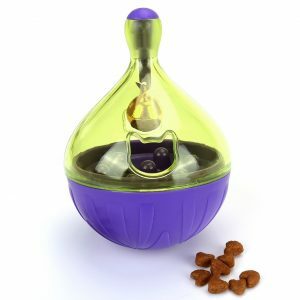 One of the most popular treat dispensers is this PetSafe SlimCat Interactive Toy and Food Dispenser. This dispenser has over 2,000 reviews and has a 4-star rating. This is a ball toy that your cat can push around, and work those treats out. It offers an adjustable opening, which releases your cat’s treats. The ball is suitable for any breed of cat and size. You can also get this in a variety of colors. 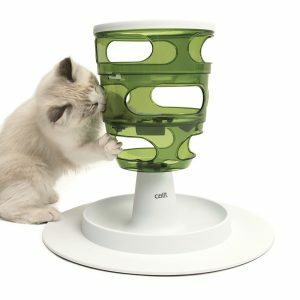 Your cat will have to work for their treats with this Catit Senses food tree! The food tree is filled with treats and your cat has to paw all the way down to a bowl, where the bowl will release a treat. It helps your cat be able to use those instincts to paw and work by hunting for their food. 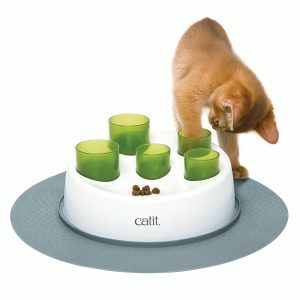 The bowl is wide and shallow so it is easy for your cat to reach in and get their tasty treat. The nice thing about this food tree is it is easy to clean. Catit Senses 2.0 Digger for Cats has tunnels that your cat can claw and dig at for their natural instincts. You hide the cat treats in the tubes and your cat will have to sniff out their treats and work for it. This is a very fun treat dispenser that is different than a classic ball. You can disassemble it which is nice so you clean it easily. 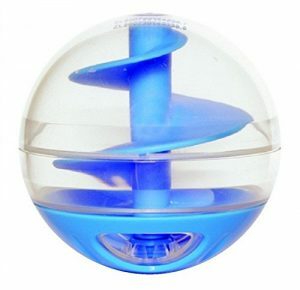 The teardrop shape of this Mogoko Smarter Interactive IQ Treat Ball wobbles when your cat bats at it. When they hit it hard enough that the treat opening hits the right angle a treat will come out. This is a very simple but fun toy for your cat. There is a bell inside so when it gets knocked around it will make noise which will keep your cat’s attention. 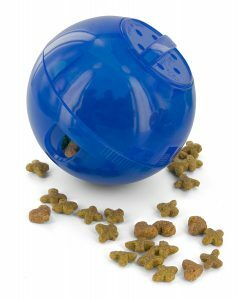 Want a simple but fun treat dispenser, then this Hagen Catit Treat Ball is a winner. 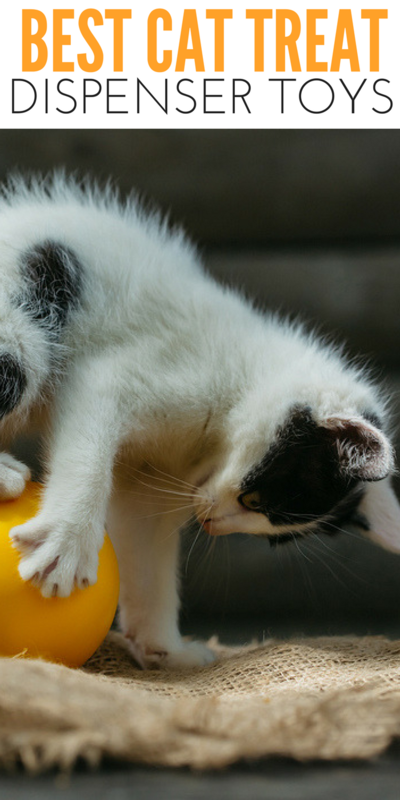 Your cat can chase and swat at the ball and work at getting the treats out of the hard rubber ball. If you don’t want to put treats in it still works great as a cat toy as well.